We've heard it over and over - from teachers, parents, and friends - "sit up straight; don't slouch!" And for good reason, too. Sitting and standing up straight help keep your spine strong and reduces chronic back pain. But good posture does more than protect your back. Good posture actually goes a long way in protecting your health. How we sit and stand provides our body with the foundation we need to move throughout the day. When it's improperly aligned, we put added pressure on our spine, and also tendons, ligaments, and joints all throughout the body. Slouching also reduces lung capacity, and makes it harder for your organs to function properly and effectively. 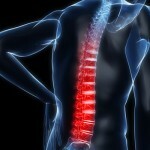 And you probably already know about the tension headaches, and neck and shoulder pain associated with chronic hunching. Try to keep your ears in line with your shoulders when you're sitting - this helps you notice when you're leaning too far forward or back. Don't sit with your legs crossed. Instead, keep both feet flat on the floor, or prop them up slightly on something. Pull your shoulders back and down when you notice yourself hunching or slouching. Aim for a chair with lumbar support. If you don't have one, bring a cushion or pillow for lower back support. Get up and move around a few minutes each hour, and take time to stretch our your muscles. Strengthen your core. Strong abdominal muscles help strengthen your back, and make it easier to sit and stand up straight.